Few dishes provide the comfortable feeling of a plate of rigatoni and sauce, a bowl of mac and cheese, or a thick slab of lasagne. Pasta has been a core food for millennia, and with a bit of research you can find endless recipes that feature our doughy friend. Plus, not only does pasta fill you up, it also has lots of nutrients to keep you healthy and energized — which is why long-distance runners eat lots of it before a big run. So it makes sense for us to celebrate this extremely versatile, useful and tasty food throughout National Pasta Month this October. The BBC aired a fake three-minute report showing a family in southern Switzerland harvesting spaghetti from the family "spaghetti tree." According to the Atlantic, a Frenchman opened what may have been the first American pasta factory in Philadelphia. Marco Polo brought pasta from China and popularized it in Italy. Pre-Roman Etruscan civilization began grinding wheat with rocks, mixing it with water and boiling it. The Chinese were apparently to be the first civilization to eat pasta. Get a big crew of your foodie friends together and get creative! Challenge your friends to bring their very best pasta dish, or to add a pasta element to their favorite non-pasta dish. From the Indian kheer vermicelli pudding to Polish peroghi dumplings to the Egyptian street dish koshari, there's a global wealth of non-Italian and non-East Asian recipes that you can research, cook and serve to your loved ones. October is also National Dessert Month, so it's time to try a sweet version of our quick and starchy culinary friend. Cook up a kugel, or chocolate-stuffed shells, or honey-sweetened Sicilian pasta crisps. In traditional Italian cuisine, pasta is usually slightly undercooked and firm, or al dente, which literally means "to the tooth." Pasta is actually OK for your dog or cat to eat in small amounts, as long as your pet isn't allergic to wheat. Italy classifies its flour into three different types: 1, 0, or 00, with type 00 being the most fine, and thus best for pasta. Most pasta is made from durham flour, and can be kept uncooked for more than a year. According to the International Pasta Organization, more than 600 different shapes of pasta are produced globally. 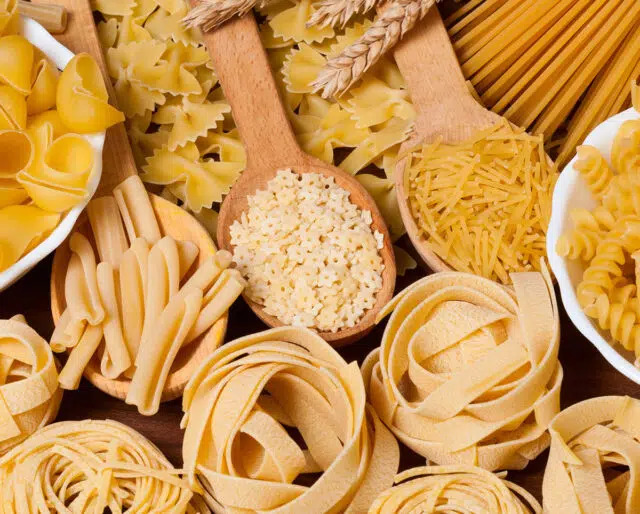 New research shows that people who eat pasta generally have better diets than those who don’t, largely because they eat more necessary nutrients and less sugar. Plus, it’s cholesterol free and low in sodium! Pasta is a complex carbohydrate, making it a great source of sustained energy for both your brain and body for the entire day. Enriched pastas also offer important energizing nutrients like folic acid, iron, and several B vitamins. If you’ve got water, a pot, and a stove, you’re three-quarters of the way to a sauce-ready pasta entree. Pasta makes it easy to feed a big crowd, a hungry family, or an event at your community center!